The Nauphoeta cinerea I received from Mark Bushell at the last Phasmid study Group meeting are really starting to fly. I managed to catch this group of nymphs before they "coloured up" (the exoskeleton is soft when the nymphs emerge and as it hardens it develops the usual brown colour). This brief white phase also occurs after the insect moults. I have seen several "albino" cockroaches on Flickr and elsewhere where people have seen a freshly moulted cockroach on display. My favourite was when I corrected somebody (I believe on DeviantArt). 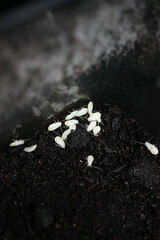 Their photograph showed a freshly emerged cockroach with it's moult (normal coloured) and other non-albino cockroaches. He replied saying that the display said it was of albino cockroaches. Liar!